Home » Manchester Invite » 42nd Manchester Inv: Race Recaps, Results, Interviews! We thought we had it good last year, but this the 42nd edition of the Manchester Invitational may have beaten last year, producing some very fast early season times as well. Granite Staters fared quite well as the host state by posting the fastest varsity individual times of the day and having several teams in contention for titles! If today was any indicator of things to come, cross country is strong in our state. Also, the fields were full, similar to New Englands, providing valuable big race experience! Defending champion Hanover fought valiantly but placed 2nd only 9 points away from the title. Last year Hanover edged Greely, Maine for the title, winning by 15 points, but this year it was Greely taking the title by 9. For the Lady Marauders, they continue to roll at MI. This time with a freshman, Lucy Gluek as their course leader placing 5th overall with a time of 19:23. As previewed, Eleanor Lawler of South Kingston, RI, took the win in 18:45. Windham’s Susie Poore was the top NH finisher placing 3rd overall with a time of 19:11. Hanover’s Glueck was a surprise NH runner-up with Oyster River’s Danielle Slavin placing 7th overall in 19:46. We don’t care what the subsequent polls will say, but the performance of the day has to go to Oyster River’s Patrick O’Brien who won in a scorching 15:22, one of the fastest times in recent memory. Top 3 all-time?? Comment below to tell us otherwise! With a fist pump crossing the line, O’Brien certainly has laid claim to not only best in NH, but a force to be reckoned with in the Northeast. Monadnock’s James Elmour (6th 16:37) and Campbell’s Jeffrey Allen (11th 16:53) were the other Granite Staters who broke the 17:00 barrier. Top NH team honors went to Oyster River which garnered runner-up honors 27 points ahead of Monadnock who placed 3rd with 151. Placing 7 in the top 10 and 12 in the top 15, the Granite State certainly dominated this race from an individual perspective. Turning in a stellar performance, Exeter’s Jackie Gaughan looked like she was on a training run, winning in 18:08. Bedford’s Leya Salis was second in 18:26 with West’s Julia Robitaille 3rd in 18:45. Other Granite Staters also breaking 19:00 were MV’s Kristie Schoffield who placed 5th in 18:53 and Coe-Brown’s Alli Pratt, 7th in 18:54. Vermont’s Champlain Valley returned to the top of the podium, not only looking poised to take home another Vermont state title, but a contender for New Englands. However, New Hampshire was the dominant state in this one taking 4 of the top 5 places. In a surprise of sorts, it was Coe-Brown, seemingly decimated by graduation, taking NH’s top honors as a team placing 2nd. Aside from Pratt and returning varsity member Sarah Dupuis running 20:02, it was a whole new cast with Hannah Daly (1st year runner), Elly McDonough, and freshmen Abigail O’Connor packing to run 20:22, 20:23 and 20:34 respectively to score 151 points. Bouncing back from last week, the Pinkerton Trail Blazers placed a strong 3rd with 173 points, but Souhegan was not far behind scoring 187. Alvirne continued to run strong placing 5th in 196. Four of the top teams in the state separated by only 45 points in a HUGE meet means and exciting close competition over the second half of the season to determine best in NH! And these may not be the best in NH (see BG’s freshmen race below!)! Boys Large School – Concord Wins! Concord (NH #1) winning the marquee race at Manchester Invitational is certainly one of the top stories of the day. Demonstrating their depth, they did this even with freshmen Ryan Devine (normally in their top 5) winning the freshman race. Senior Jamie Wilkes led the way placing 4th in 16:17. He was strongly supported by sophomore Forest Mackenzie placing 11th in 16:28 and junior Oliver Spencer placing 15th in 16:39. These performances were expected, but to have Eli Boesch-Dining and Alexander Duncan both run 16:59 as their 4th and 5th scorers, well the day certainly belonged to the Crimson Tide as NH’s only team to take home a varsity title. Further, they have more than earned the righ t to be called NH’s best over the first half of the season. Nashua North (NH #2) placed 3rd in a 1 point edge over Coe-Brown 149-150. Pinkerton was 7th with 201 points. NH also took 7 of the top 10 individual places, and this week, we saw a new top D1 individual in Londonderry’s Chris Zaino, who placed 3rd in 16:05. Concord’s Wilkes ran a smart, patient race to place 4th while Alvirne’s Noah Bellomo, was even more patient and placed 5th in 16:18. Pinkerton’s Calvin Graves, North’s David Vorbach and Connor Muise rounded out the top 10 for the Granite State in 16:20, 16:21, and 16:22 respectively. Champlain Valley (VT) easily repeated with Emma McMahon also taking the individual title in 20:57. Pinkerton, powered by Annie Sullivan and Samantha Mangano placing 4th and 5th respectively, was the top NH Girls JV team placing 3rd with 110 points. Top NH individual finishers were Emi Boyd-Tucker (Keene) placing 3rd in 21:34. Ok, so yeah, Bishop Hendricken shut out the rest of the meet taking the top 7 plac es. Pinkerton was the top NH team finisher led by Steven Groulx’s 17:31. 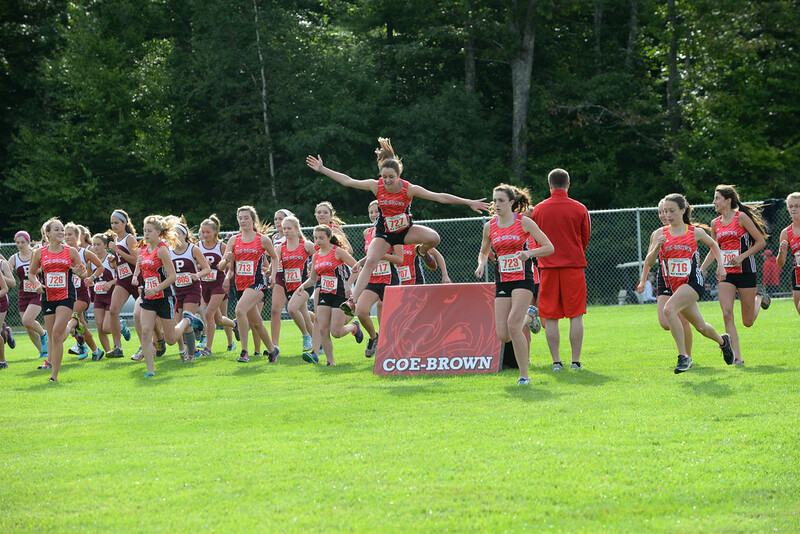 Coe-Brown placed 4th with 153 points to Londonderry’s 5th and 167 points. Definitely a candidate for performance of the day, this may have been too fast for anyone to notice, but BG’s Caroline Fischer broke the course record in a blazing fast time of 12:14 (5:50 pace). Almost as impressive, Bishop Guertin took home the team title as well, with Caroline Towle and Haley Schmitt running 13:08 and 13:20 respectively. Londonderry placed 3rd then Pinkerton, Bedford, Exeter and Portsmouth as NH took the top 6 team places!!!! Concord’s Ryan Devine took this one in 11:27 with teammate David Cook placing 4th in 11:43. Bishop Hendricken (RI) won the team title by only 3 points over Pinkerton. Concord placed 3rd, Coe-Brown 4th, Winnacunnet 5th and Londonderry 6th. O’Brien was 2nd fastest Manch Invite behind Ben True’s 15’17 from 2003 (i think). Though the actual course record is 15’08 via Trevor Hopper’s New England’s win when it came to Derryfield in 2013. Previous post 2016 Manchester Merges! Accurate Predictor?? Next post MI42 Race Videos!